The Digital vacuum Wax Injector retains the best features of the original unit and introduces enhanced features that will increase your production & save your money. These injectors are highly appreciated in jewellery industry used for injecting wax. These injectors are easy to install and high in recital. The cost of these injectors is very cost effective. These machines are automatic and very smooth in performance. We, Glowel, are leading and appreciated name in the market established in the years 1992, at Delhi, (Delhi, India). 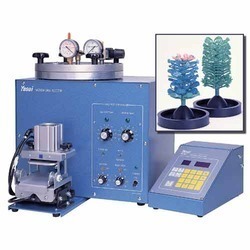 We are best and biggest name in the market by offering our patrons excellent and finest quality assortments of Graphite Crucible, Rolling Machine, Jewellery Casting Machine, Auto Clamp Wax Injector, Jewellery Casting Kit, Flexible Shaft Hanging Motor, Jewellery Setting Equipment, Jewellery Polishing Instrument, Diamond and Gold Making Instrument, Jewellery Micro Motor, Magnetic Polishing Machine etc. These machines are designed by our modern technology and skills. They are sleek and very easy to install. They are compact in design and very easy t use too. They are manufactured by our skilled professionals with the use of best machines and technology to keep it as per set quality norms. Without any Doubts Glowel is One Stop Solution to The Jewellery Manufacturer for All There Needs and Serves as an “Problem Doctor".